You are currently browsing articles tagged Northern Presbyterian Church. The early twentieth century in the northern Presbyterian church was increasingly one of a battle over the Bible. 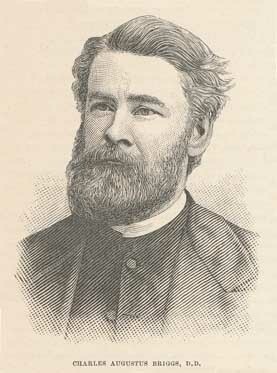 Charles Briggs, of Union Theological Seminary in New York City, had just been indicted for heresy and found guilty by both his presbytery and the General Assembly. In the midst of this trial and subsequent indictment, there was a proposal to revise the Westminster Standards by 15 presbyteries of the denomination. The result was the addition of two chapters to the Confession on the Holy Spirit and the Love of God and Missions, composed of chapters 34 and 35. Further, some language was changed in chapter 16 relating to the works of unregenerate men. Instead of these works being considered sinful and unable to please God, they were described as “praiseworthy.” Last, a declarative statement was added to better understand Chapter 3 of the Confession as it related to God’s eternal decree. Whether such a momentous change was due to potential union talk or not, it is interesting that soon after this change, joint discussions arose with the possibility of union with the Cumberland Presbyterian Church and the Northern assembly of the Presbyterian church. Remember, around 1810, a division occurred over Calvinism and the Westminster Standards in the Presbyterian Church, which division brought about the Cumberland Presbyterian Church. Now this Arminianism denomination was being invited to reunite with the Northern Presbyterian Church, without any change on their part with regards to their Arminian beliefs. The plans for that union were adopted on February 19, 1904. 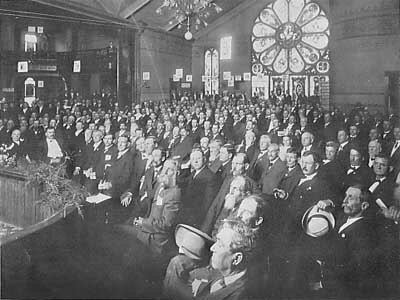 After some further refinements to the plans, the last General Assembly of the old Cumberland Presbyterian Church met in May of 1906 [pictured below]. Over 1100 Cumberland Presbyterian teaching elders joined the ranks of the Presbyterian Church, bringing their number up to 9,031 men. Over 90,000 members came into the fold of the Presbyterian church. The union wasn’t complete however, in that, some 50,000 stayed out of the union, and continued on as the Cumberland Presbyterian Church. But what was found in the union meant in reality that the Presbyterian church was no longer uncompromisedly Reformed in doctrine and life. That was to have a profound effect on the next 30 years of existence and testimony. Words to Live By: Beware of a tendency to lower your Biblical testimony, and that of your church or denomination, to suit the ever-changing sentiments of the world around you. Your standard is always the Word of God, never the word of man. The second major problem of those who stay in the liberally controlled denominations is the natural tendency to constantly move back the line at which the final stand will be taken. For example, can you imagine Clarence Macartney, Donald Grey Barnhouse or T. Roland Phillips being in a denomination in which the baffle line was the ordination of women? Can you imagine these great evangelical preachers of the Twenties and Thirties (who stayed in the Presbyterian Church USA) now being in a denomination which refuses to ordain a young man whose only fault was that while he said he would not preach against the ordination of women yet he would not say he had changed his mind that it was unbiblical? Can you imagine that these leaders of the conservative cause in an earlier era would have considered it a victory to have stalled the ordination of practicing homosexuals and practicing lesbians? What do you think Macartney, Barnhouse, and Phillips would have said about these recent developments? Such a situation in their denomination would never have been in their minds as in the realm of conceivable. © 1980, Christian Education Committee of the Presbyterian Church in America.